Streamlight leads the industry with premium illumination technology--from flashlights to great add-on accessories. Charging your Streamlight products in the field, or in public areas with convenient, ready access to wall outlets can often be challenging. That's where the brand's innovation comes to play, with Streamlight's 12V DC power cord that can accommodate both demands. 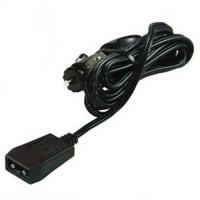 This power cord takes 12V plugs and funnels its power source from a vehicle. The cord measures ten feet, providing ample distance to work with while charging. Just as their motto states, trust Streamlight--heroes do!